An Invention to better your camping experience. Camping is an adventure which everybody wants to experience at any time of the year. Yes! At any time. But rains and other weather conditions could just force you to rethink on your plan and consider some other option. 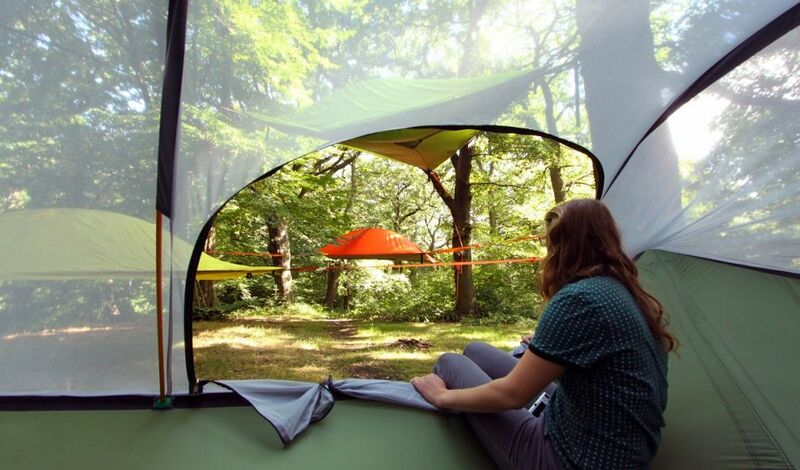 All this disappointment can be now avoided with Tentsile Stingray. 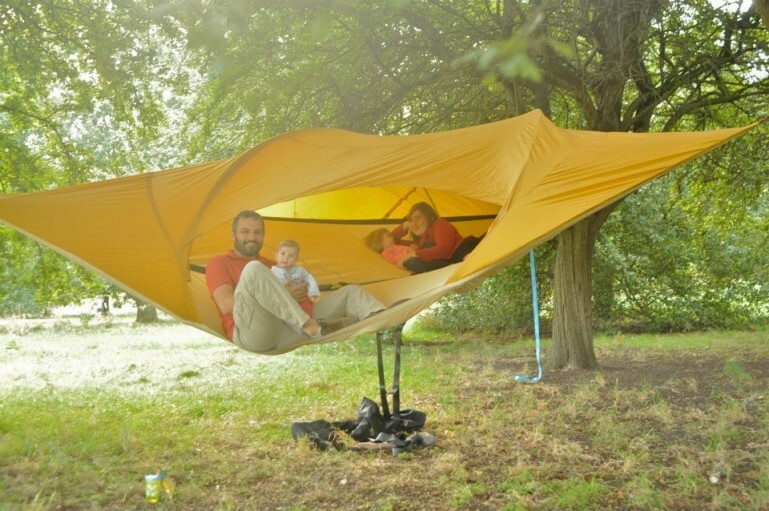 Tentsile Stingray is a back-packable tree house that you can carry anywhere. It’s extremely child friendly where you can put your tots inside the Tentsile and allow them to have fearless experience on the camping site, away from dangerous bugs, insects and other reptiles or predators. Originally conceptualized by Alex Shirly- Smith, a Tree house Architect who dreamt of allowing people to hangout on trees, this prop is way too good to not buy it for your next camping trip. Very similar to Hammock style it takes care of a single day trip as well as an overnight trip too. Since its inception in March 2010 it has receive tremendous customer satisfaction (40000 hits in 24 hours) and has proved to be the best, light weighted and a flexible camping solutions. 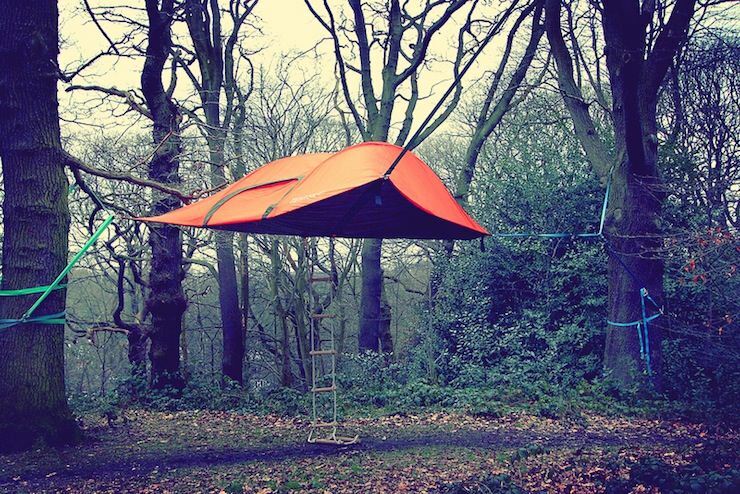 Tentsile is a portable and a suspended shelter. It facilitates multi-person occupancy and is made to be suspended above the ground. This makes it suitable for any kind of environment. Unlike a conventional tent, this one is suitable to dry and wet ground conditions. Be it a safari safe house, a regular camp, a mountain or a beach treat, Tentsile suits all your conditions. It can be comfortably adjusted to a bed to lay on and a sitting chair as well. It comes along with an insect mesh roof, a waterproof polyester fabric fly and a PU coated UV resistant which protects you from heavy sunlight during the day and insects at night. It has three anchor points which can be use to tie it on a strong vertical support for suspension. Each anchor comes with webbing frame and the floor straps can be converted to individual hammocks. Easily suits camping trips, outdoor visits/activities, scientific research trips and safari. For safety, it is best suited for a height of 1.2 m/4 feet above the ground level. Unique design gives comfortable and spacious accommodation in any environment. Suspension keeps the experience away from unfavorable ground conditions providing safe distance from bugs, snakes and other reptiles. Check the Website, video and detailed specifications for all your answers and view their collection here. I am sure by now you have agreed that this prop is an impressive one. It’s an encouraging way for you and your fellas to have your outdoor experiences in style, comfort and compete strongly with unfavorable ground conditions. If you have already experienced this, share it with me in the comments below.